When booking your travel across WhataHotel!, guests are able to experience exceptional quality at some of the World's Best Hotels while also receiving Complimentary Perks that are combinable with impressive specials. Travel today can be filled with amazing hotel options that only add to the excitement of your trip. Check out these hotels that guarantee guests will find bliss in not only their hotel's spas, restaurants and poolside bar, but also in their hotel bathroom. Whether you are looking for romance, seclusion, allure or maybe an unforgettable sunset, let WhataHotel! 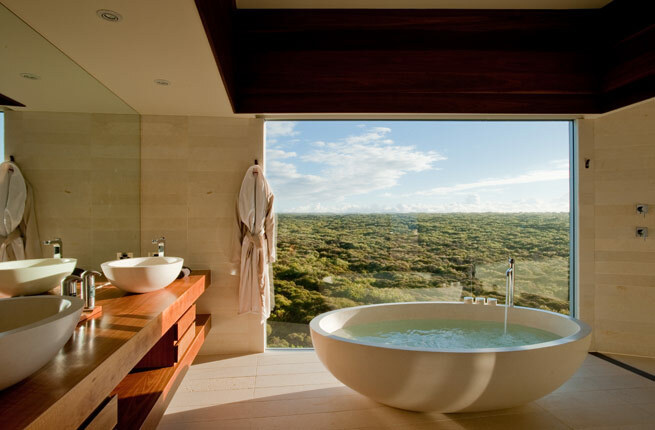 find the perfect spot for you to run a bath and soak away your worries. For the Best Bathing Down Under, travelers can book a room at Osprey Pavilion at Southern Ocean Lodge on Kangaroo Island, Australia. The granite tub is soak worthy and a hand carved masterpiece situated in front of the full view window. The wood accents are stunning and double vanity sinks are modern and chic. The heated limestone floor provides amazing warmth and the views display the coastal beauty only found in Australia. Situated in an open floor plan suite, this bathroom is perfect combo of sleek and comfortable. Offering the Best Bath for a Sunset View, the romantic and rustic Post Ranch Inn is the epitome of rustic elegance. Located in Big Sur, California, Post Ranch Inn has won awards for it's privacy and seclusion ensuring a romantic retreat and a relaxing bath in the Upper Pacific Suite proves to be fantastic. The suite is situated on top of a 1,200 foot cliff and features carved wood walls, a wood burning fireplace, heated floors and a stainless steel outdoor hot tub. As if these amenities weren't enough, the luxurious bath extends to the outdoors so that guests will literally be one with nature. 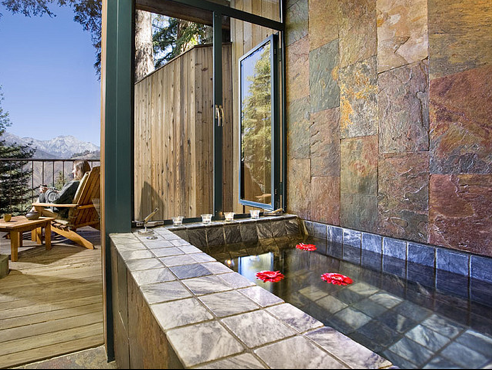 Soak in this gorgeous stone tub and watch the sun meet the sea at the cozy and stylish Post Ranch Inn. If a fascinating trip to India is in your future, check out the gorgeous allure of the Maharani Suite in the Taj Resorts spectacular Umaid Bhawan Palace. Located in Jodhpur, India, this suite was designed for royalty. The Art Deco room was built somewhere between 1928 and 1943 and spans an impressive 4,850 sq ft. It is decorated with mirrors and chrome with pink walls and black accents. 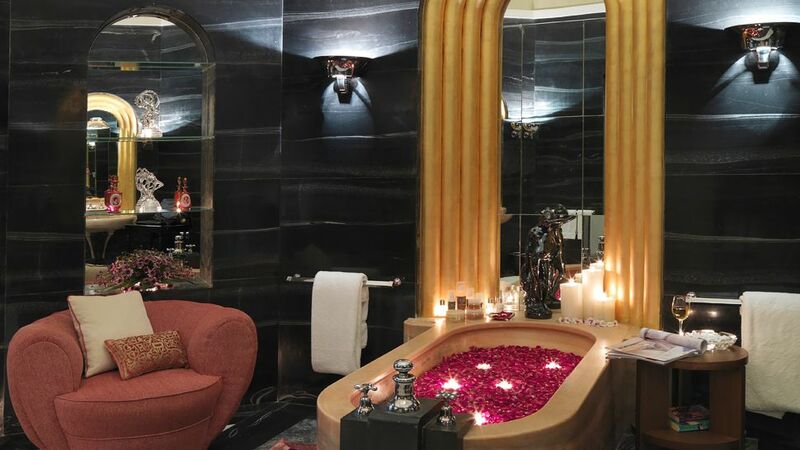 But what really stands out in this sumptuous suite is the bathroom. The bathtub was carved out of one piece of pink marble and also features a steam room and Jacuzzi. This enticing bathroom makes it an easy choice for most exotic hotel bath. 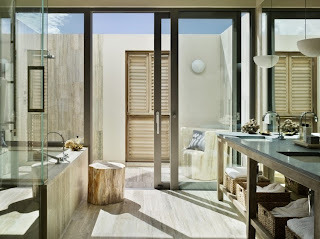 When looking for Best Indoor/Outdoor Bathing, The Viceroy Anguilla gets the prize. The Beachfront Villa is massive and the two upstairs bathrooms are roomy with vast showers and deep soaking tubs. 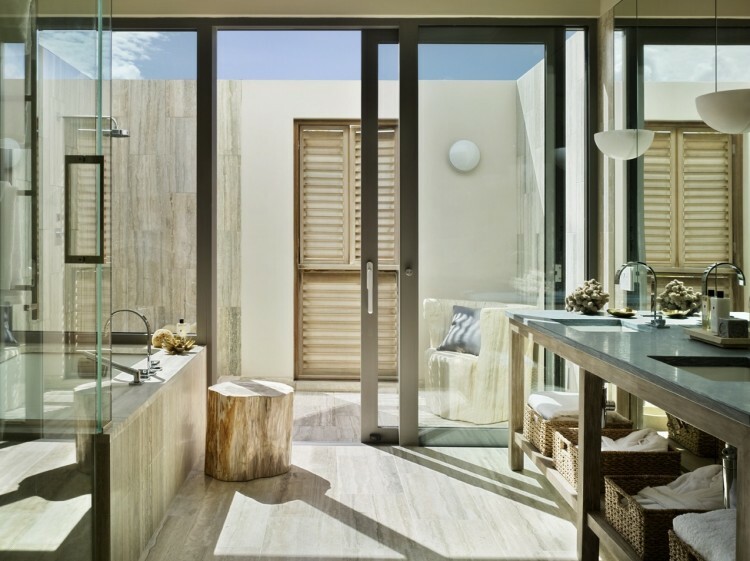 But if you can't get enough of the fabulous weather on this Caribbean island, the private outdoor shower and relaxation area promise you will enjoy every bit of the great outdoors during your stay. 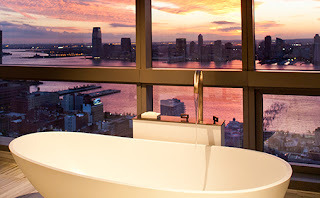 It comes as no surprise that the Trump ego required a winner in the fabulous bathroom category, and this winning bath is located in the always sophisticated New York City. The Penthouse at Trump SoHo gives guests an unobstructed view of the city's breathtaking skyline. The floor to ceiling windows showcase views of the Hudson River and promise that the city will sparkle once the sun goes down. Grab a bottle of bubbly and soak away the stress of big city life in this truly epic bathroom. When looking to find the Best Bath for Honeymooners, the South Pacific proves to be the winner. 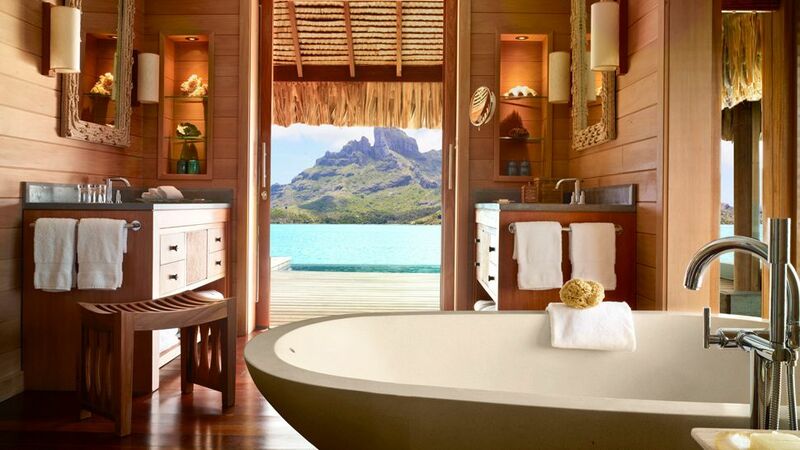 Four Seasons Resort Bora Bora is the ultimate honeymoon destination and the baths here are simply seductive. The over-the-water bungalows offer plunge pools and the rooms are comfortably minimalistic. 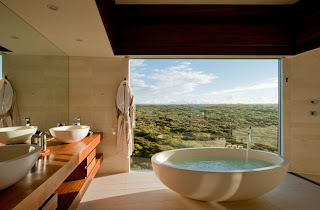 The freestanding tub in the on-suite bathroom promises to give guests the perfect view of the iconic Mt. Otemanu. Secluded over the shimmering lagoon, Four Seasons Bora Bora is the perfect place for couples to start their lives together. And last but not least, we visit the bathroom that is Best for Rock Stars. Named the Freddie Mercury Suite in the gorgeous Eden Rock Resort on St. Barths, this bath was designed with rock legends in mind. The Villa Rockstar features four suites with butler service, a recording studio and even a whisky bar stocked with 40 different varieties of the carmel colored elixir. The Freddie Mercury Suite has the best bath by far impressing guests with the hand-cut while gold tiles that cover every surface. This bathroom is sleek, plush and every bit rock and roll. Who knew that the bathrooms in many of the hotels and resorts around the world could be so extraordinary. In fact, they are enticing enough that you might find yourself booking a trip on the premise of the bathroom alone. Hey, it could happen! 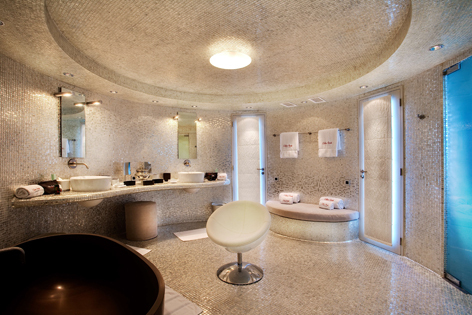 With bathrooms this amazing, you can only imagine how magnificent the rest of the resort will be. Let WhataHotel! find the perfect vacation getaway, combine that with unbeatable deals and perks, and discover vacation salvation.